On Thursday, March 22nd, C.L.A.S.S., with support from the Council of Fashion Designers of America (CFDA), hosted an intimate gathering of fashion’s industry leaders, designers and members of the press to celebrate An Evening of Smart Innovation. An exceptional team of artists, filmmakers, food and textile designers created an immersive experience that engaged the guests’ senses highlighting smart innovation as the new standard for fashion. 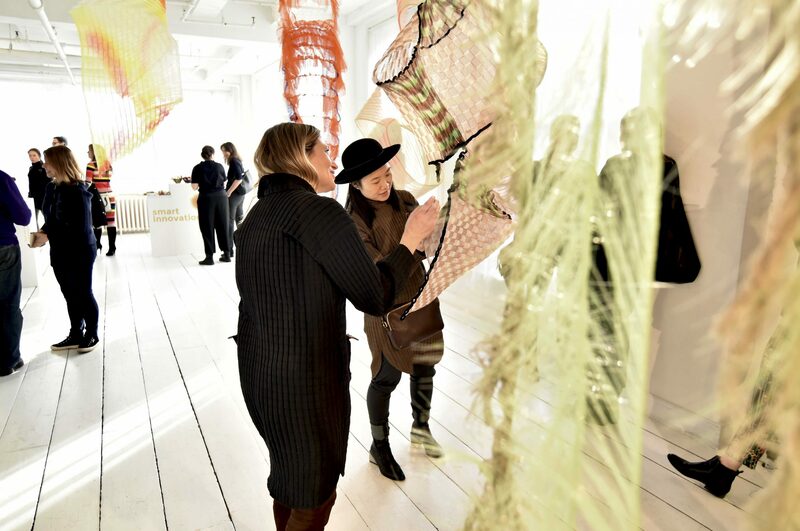 The experience examined the four key areas that are vital to C.L.A.S.S.’s business philosophy: Heritage – Smart Innovation – Circular Economy – Design Responsibility. The immersive experience started with a video, created by the Award-winning Italian artist and director, Cristina Picchi, that connected the delicate balance of nature, biology and technology. From there the Swiss knitwear designer, Cecile Feilchenfeldt used her artistic abilities to weave a magical forest from fabrics by C.L.A.S.S.’s textile partners. Brooklyn’s own fashionable catering company, Poppy’s used locally sourced ingredients to craft edible apple and winter gourd bowls with roasted apple-beet blue cheese dip & caramelized whey & apple chips, as well as, dried beet dyed lotus root, red beets and pineapple bowls filled with winter fruit & vegetable chips, served with cold and hot beverages, turmeric & star anise infusion and a ginger-lemon-mint tea. The piece de resistance was the opportunity to touch and feel the luxurious sustainable textiles produced by C.L.A.S.S.’s partners, beautiful cottons, rich camel hairs and dense cashmeres. Representatives were on hand to help guests explore the available options from Bacx by Centro Seta, Bemberg™ by Asahi Kasei, ECOTEC® by Marchi & Fildi, Organic Cotton Colours, Re.VerSo™, ROICA™ by Asahi Kasei, TINTEX Textiles, Zignone.